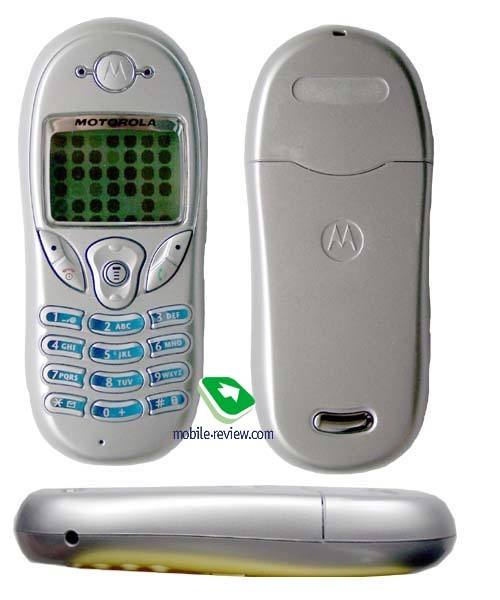 Motorola C300 is the next model after T191, which is taken out of production. This entry level phone would be manufactured up to the autumn of the next year. As well as T191 it is elaborated by BenQ, and it would be manufactured on its plants. Hence, we can find many features that are not typical for the phones from Motorola. First, what we see is a rounded design, the handset is very handy. It weighs 82g and doesn't look like a phone of the entry level, the dimensions of the phone are also not large - 106х44х16.5mm. When you switch on the phone you'll pay attention to the blue backlighting of the screen, a keypad backlighting goes well with it, it's also blue but it's brighter. The screen has a resolution f 96x64 pixels, what allows to show up to 4 text lines and tips to the soft keys use (when reading messages). In other cases only up to 2 text lines and 2 service lines can be displayed. The font is similar to the font in T191, all the information can be easily read. You can see a vertical 2-positional navigation key with a Menu access button under the screen. You don't feel any discomfort while using the functional keys, accidental pressures are excluded, even if your hands are large. Soft-keys are united Soft buttons joint with Send and Hang-up buttons. The keypad is made of plastic; the keys are slightly raised above the phone. Alphanumerical keys are quite convenient, though you can't dial a number with ease. The keys backlighting is very bright. In the average lighting conditions the central row is clearly visible, the right and the left rows are worse distinguished. The symbols of the keys 6 and 9 are almost not seen. A charger connector is placed on the bottom side of the phone; a portable handsfree connector is positioned on the left-hand side. The phone is equipped by the nikel-metal-hydrid battery of 500 mAh capacity (in Russia), the lithium-ion battery (in European countries). The manufacturers declare that the phone can work up to 80 hours in the standby mode and up to 2.5. hours in the talk mode. In reality the phone worked 2 days in case of 20 minutes of talking and minimal using of other applications. The time of full re-charging is about 1.5. hour. Pressing of the left soft key in the standby mode brings you to the phonebook. While pressing the right soft key you get access to the menu Messages. The items of the main menu are psituated in the circular order. You see a title on the right and animated icon on the left. A sortcut number navigation is available. You don't need to press exactly the soft-key, you can just press a send or reject keys and the result will be the same. Let's turn to the main features. Phonebook. Up to 100 phone numbers can be stored in the phonebook memory, only one phone number can be added to one name. All the phone numbers (from the phonebook memory and Sim-card memory) are displayed in the total list simultaneously. Both the phone number and the name are seen. There is a quick search by the first letter. You can easily sort the phonenumbers by 4 caller groups. A special ringing tone, vibrating alert, SMS tone and icon can be associated to each group. Up to 10 phone numbers can be voice dialed; voice tags are recorded at once. This feature works well even in noisy conditions. Messages. The handset supports EMS (version 5), so you can attach pictures and simple melodies to your messages. The phone ahs 128kb of memory space to keep received pictures and melodies. There are limitations of the received data format. For example, animation supports only up to 10 shots with the resolution of 96x64 pixels. The images of larger size are not displayed, the same is with melodies (the limitation of 100 notes). The phone supports iMelody 1.2. The peculiarity of the phone is that it supports the receiving of graphics and melodies which are sent in Nokia Smart Messaging format (from the phones manufactured by Nokia, Samsung, LG and Motorola C300, of course). Such messages are converted to EMS format, it's a unique feature today. SMS Chat is available; there are up to 25 templates and 10 empty fields for the messages. Media Library. You can get access to the pictures, animation and melodies. Corresponding files are downloaded from the special CD here. This CD is possible to purchase as an additional accessory. Calls. The user can find here everything what is connected with calls. Phone settings. Traditionally all settings concerning security, wap-browser access (version 2.0!!! ), menu language, backlighting duration are collected here. Up to 5 screen savers are pre-defined in the phone, you can also download up to 3 of your own (via Wap). .
Games. According to the manufacturer there are 6 pre-default games in the phone but I found only two ones in my sample - Answer (like a Tetris) and Numbers. Audio settings. There one can select a ringing tone, its type (mixed or just melody) and setup the profiles. Totally up to 27 ringing tones are pre-deafult on the phone, you can also download up to 5 of your one. The melodies are usual, the volume of the ringing tone is not always sufficient. One of 5 tones can be selected as an incoming SMS alert. Instruments. Everything s common here. A simple organizer (up to 500 notes), stop-watch, countdown timer and calculator are available. You can setup autopower on/off feature and alarm clocks (once, daily). Alarm clocks work even when the phone is switched off. There are no claims to the quality connection: the sound in the loudspeaker is quite good, no noise. The ringing tone is not always heard, its volume is average. However the vibrating alert is rather strong and it partly improves the situation. Don't expect much from the using of the entry level phone, it's not very comfortable. As for me T191 was more ergonomic than C300, the keypad in the new model is not so handy. There are some delays while menu listing and items selecting. In the whole the phone is not bad, a blue backlighting and a renewable design is very attractive. The phone would be launched already in the middle of November, the expected retail price is 120-130 USD. The main rival model would be Siemens C45. We think that the phone design would be the key factor, which would influence the consumer choice, not the phone specifications. In our opinion C300 wouldn't be very popular at first; it's a rather expensive phone of the entry level. It would be in requisition when its price decreases to 70 USD. It's difficult to predict now the exact date but most likely it would be in the beginning of the next year, in the end of this model production.